Unveiled last week, the new system integrates a set of technologies — Wi-Fi, thermal cameras, biometrics, closed-circuit televisions, and sensors — to create a security network across an entire game reserve. 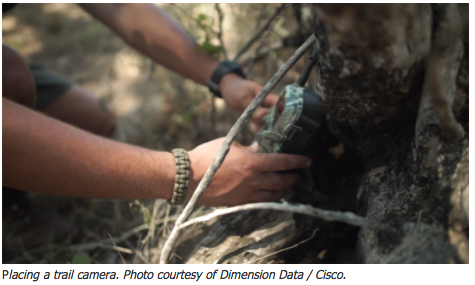 The new technology system — called Connected Conservation — is a joint initiative between two international technology companies: Dimension Data and Cisco. It aims to allow rangers to be more proactive — in other words, to find and stop poachers before they kill. To test and refine the system, the two companies installed the system in a private game reserve adjacent to Kruger National Park in South Africa. An innovative new technology might be able to protect rhinos like never before. Unveiled last week, the new system integrates a set of technologies — Wi-Fi, thermal cameras, biometrics, closed-circuit televisions, and sensors — to create a security network across an entire game reserve. What makes it so promising is that it helps rangers react earlier, faster, and more effectively — which in turn keeps rhinos, and those who protect them, safer. The new technology system — called Connected Conservation — is a joint initiative between two international technology companies: Dimension Data and Cisco. It aims to allow rangers to be more proactive — in other words, to find and stop poachers before they kill. “If you’ve heard a shot, it’s too late,” says David Powrie, a warden at a private game reserve in South Africa. In other words, if rangers wait to act until poachers’ guns are already going off, a rhino is probably already dead. This system activates earlier — when or before a poacher enters the reserve. That “gives rangers more time and more opportunity to catch the poachers, prior to a killing,” says Bruce “Doc” Watson, Dimension Data’s group executive who spearheaded this effort. To test and refine it, the two companies installed the system in a private game reserve adjacent to Kruger National Park in South Africa. The communications and surveillance infrastructure now covers the reserve’s entire 135,000 acres (about 54,600 hectares) and 55 miles (about 89 kilometers) of fence lines. It includes a wireless network that allows instantaneous sharing of information between rangers, cameras that monitor the perimeter and gates, and collection of biometric data of those entering or exiting the reserve. A central command center manages the data and uses it to run anti-poaching teams and shift their operations in real time according to new information or intelligence. Already, the results are positive. 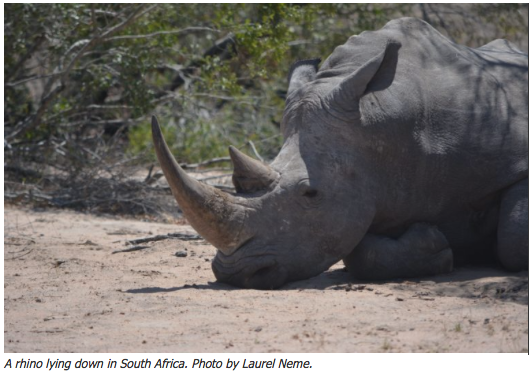 In 2012-13, the private reserve where David Powrie is a warden lost 48 rhinos. So far this year, less than five have been killed. Similarly, the number of attempts by poachers — or incursions — has also declined as poachers now perceive this reserve as a high-risk place. 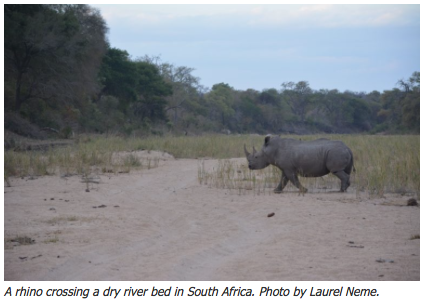 That is a significant improvement, especially when compared to neighboring Kruger National Park, where incursions increased 28 percent over last year — to 2,115 incursions, or more than eight a day — even while the number of rhinos killed declined. 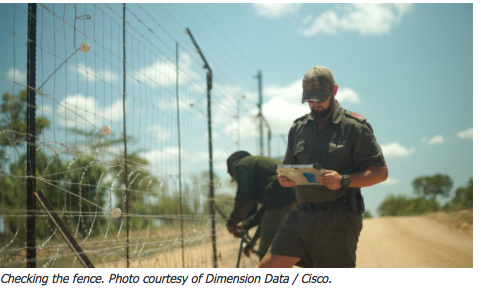 In addition to changing perceptions, the Connected Conservation technology system acts as a “force multiplier.” Rather than depending solely on human patrols, now entry points and fence lines can be monitored remotely and continuously. Cameras stream live, so that rangers responding to a report of a poacher know what is happening at any point in time. If poachers enter the reserve, the central command knows immediately and can quickly mobilize helicopters and a reaction team. That’s what happened during a recent incident when rangers, along with a helicopter, searched for a gang of four poachers who had cut the fence. Following a shootout, the rangers caught one of the poachers, though the others fled. Yet that was not the end of the operation. The poachers that escaped were caught on camera so that rangers were able to follow up. The system also records biometrics and vehicle information for everyone entering and exiting the reserve. That information enables security to monitor who is moving in and out of the protected area. The information can also be used to piece together the organization of poaching syndicates, as well as names of their members and associates. That, in turn, can spur additional surveillance, and optimally identify a whole cadre of people up and down the supply chain. While one issue around expansion of this system is cost, thus far the technology and its installation has been absorbed by Dimension Data and Cisco. The private reserve pays for operating costs, which it sees as cost effective.